If you’re getting married on the beach, or having a beach-themed wedding, there are some wonderful combinations of flowers you can use to set the right tone. You can choose colorful beachy flowers that bring to mind a beautiful sunset viewed over calm waters. Or you can opt for pristine-colored flowers that conjure images of immaculate, white sandy shores. Of course, you can always go with flowers in various shades of blue like the many colors of seas that cover the earth. Flowers for a beach wedding might be tropical or they could reflect the vegetation of a cool-water coastal area. Since there are so many possibilities for beach wedding flowers, we’ve noted just a few that we think would look stunning at your affair. A tropical bouquet for a beach wedding can include a mix of calla lilies and elephant ear. This pairing offers a distinct island feel. 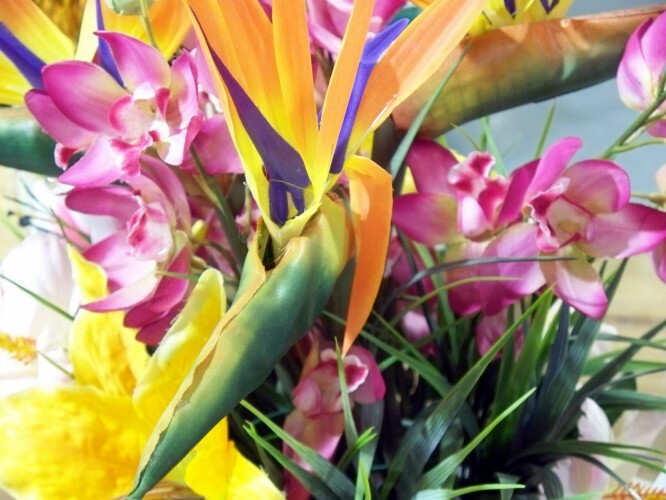 The colors of the Caribbean come to life in island bouquets made with galax, areca palm, and papyrus. A green bouquet of glorioso lilies, leucodendron, cymbidium orchids, and hosta leaves offers a dramatic look for a beach wedding. Pretty pink flowers look gorgeous against a backdrop of white sand and turquoise waters. Choose pink orchids, calla lilies, nerines, garden roses, and blushing brides. You don’t have to focus on certain colors or types of flowers when you’re choosing bouquets for a beach wedding. You can always choose blooms that are your favorite, and then decorate them with little beachy trinkets like seashells or sand dollars. If you have any ideas for flowers for a beach wedding that we haven’t mentioned, would love to hear about them in the comments below. Did you have a beach wedding and include a mix of flowers you’d like to share with our readers? Feel free to reach out and let us know. If you’re getting married on the beach, or having a beach-themed wedding, there are some wonderful combinations of flowers you can use to set the right tone.You can choose colorful beachy flowers that bring to mind a beautiful sunset viewed over calm waters. Or you can opt for pristine-colored flowers that conjure images of immaculate, white sandy shores. Of course, you can always go with flowers in various shades of blue like the many colors of seas that cover the earth.